"We are in an era of “new science of HR.” Prehire assessments are among the easiest way to apply this science to your organization." - Josh Bersin, Deloitte. Pre-hire assessments are used to screen job applicants and can include testing of cognitive abilities, knowledge, work skills, and language proficiency. Does your company use pre-hire assessments? Tell us how well you believe the assessments are working for your company in the comments below. How do you choose these assessments? The assessments (tests) should be chosen in such a way that can save your time and money in the screening and ultimately finding people with a strong fit for the job. You will be able to double your success rate for hiring with just a few carefully designed assessments. Interview Mocha has developed its science of skills assessment. Interview Mocha has come up with its “Science of Assessment” methodology which helps to screen candidates in a methodical way. How can you apply this science of pre-hire assessment to your hiring process? So here are some of the important factors that determine how you can find people with strong fit for the positions with Interview Mocha, an online assessment software. Interview Mocha provides skills related tests so that employers can evaluate candidate’s knowledge on a particular skill or concept. Concept wise or framework wise tests have been created by our content matter experts. Say for Example - Our skills test has helped our customers to separate Hibernate experts from Java coders. If a candidate takes the test a month ago and repeats it today, will he or she get a similar test score? A test that yields similar scores is said to measure the characteristic reliably. Reliable assessment tools produce dependable, repeatable results. Interview Mocha offers reliable tests that are unaffected by measurement errors. And the degree to which test scores are unaffected by measurement errors is an indication of the reliability of the test. For example, the thermometer measures the temperature, what if someone claims its measures wind velocity. Obviously, you will not believe on him. Validity refers to the accuracy of a measure. A measure is valid if it actually measures what it says it measures. Interview Mocha offers you the tests that are valid and are able to demonstrate that those who do well on the test do well in performing the job and those who score poorly on the test perform poorly on the job. Interview Mocha tests measures what it says it measures. A good assessment must give balanced emphasis to both theory and practical questions. Interview Mocha’s software provides a balanced mix of theory and practical questions so that an employer can easily evaluate candidate’s knowledge on various concepts and coding too. How Interview Mocha's existing customers find tests useful? Companies of all sizes use Interview Mocha for pre-employment skill testing. Interview Mocha’s assessment have helped companies to eliminate 80 percent of unqualified candidates. Companies have found that their candidate evaluation process with Interview Mocha has become objective and they are now able to select right candidates. Find out how Saviant Consulting improved conversion ratios in face-to-face interview with Interview Mocha. While providing a one stop solution for screening candidates, we make sure that our skill tests are based on the “science of assessment” and “quality questions”. Now what we mean by quality? How are these tests evaluated for their quality? What parameters are followed in regular research? Interview Mocha has answers to each and every question of yours. Below are some of the parameters of the test that are kept in mind before creating a test. Interview Mocha has hundreds of tests and each test is checked for its quality and correctness. Interview Mocha conducts regular research for various job roles and relevant skills required for a particular job role. The questions are structured in a way that a particular test will have a proper balance of easy to hard questions. The questions are framed in such a way that you can evaluate in depth knowledge of a candidate. Let’s say you are hiring for developers, you need to assess candidates as per the experience they have. Here, Interview Mocha provides you ready to use java coding tests from basic to high level, so that you can easily assess the skills and ability of experienced as well as fresher candidate. 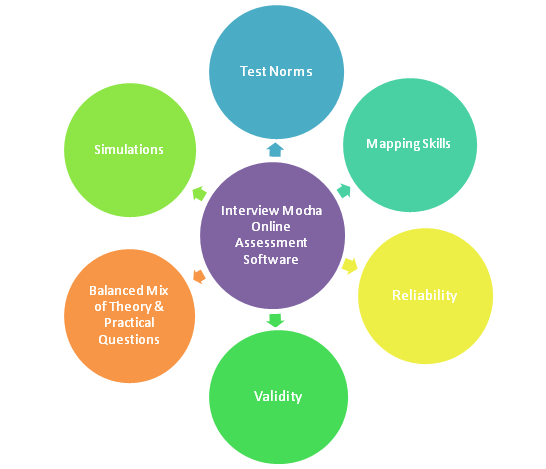 Interview Mocha assessments include different types of questions. Fill in blanks – Fill in the blanks test candidates’ ability to recollect facts and trivia the candidates’ has learned. When it comes to designing or creating a particular test, Interview mocha makes sure that a test is created with all its topics covered in it. The purpose to make each test comprehensive is you can evaluate the student's knowledge or mastery in the fields of study. Each of the tests is designed with a combination of theory and practical questions. With a proper mix of theory and application questions, you can easily evaluate candidate’s knowledge on various concepts. This proper balance of questions will ensure you that the candidate has in-depth knowledge in a particular subject and can apply it in the real world too. Liked the sound of our trumpet! You will like our product too. Leave your pre-hire testing to Interview Mocha. Your pre-employment skill testing will be in safe hands. Is your company looking for pre-employment skill testing software to improve your hiring success rate?